Quiz : See the end of the post. Do you know the other case that keeps Ram Jethmalani busy today ? Dont worry, I wont inflict my opinion about the Jessica Lall case on my hapless readers. There is plenty of coverage about that on the blogosphere, heres a couple. I will focus on only one point. 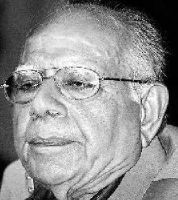 Why is everyone worked up over Ram Jethmalani representing Manu Sharma ? Lets say, if a certain Supreme Court advocate Krishna Singh had taken up this case, would we see the same outrage ? What if the said Krishna Singh had followed the same defence tactics ? Lets step back a bit and address a more fundamental question. Does the presence of a superstar lawyer mean that the accused is more likely to be guilty ? Is Manu Sharma playing foul by shelling out crores and hiring this wizard of “legal points” ? If you are so worked up over a single superstar lawyer representing a client, you might want to answer this quiz. Not just one but the top three supreme court superstar lawyers Ram Jethmalani, Soli Sorabjee, and TR Andhyarujina were all hired recently to defend a single case , can you tell us which one ? Soli Sorabjee and Ram Jethmalani have fought countless legendary legal battles in the Supreme Court against each other, what is the case that puts them on the same team ? Answer in the comments section later. I think its the Ninth Schedule case pending in the Supreme Court, Jethmalani is representing the TN government worried over its 69% reservation. IIRC, the Ninth Schedule case. Confused and Vivek : Mostly correct ! Shallow Ocean : Only Ram Jethmalani appeared for Afzal in the SC. These three in addition to Addl Solicitor General R. Mohan appeared for Tamilnadu to defend the reservations act for TN during the course of hearings about the Ninth Schedule. There simply does not exist a better (or more expensive) legal team than this. It turns out the specific case of TN not even being heard. The larger issue of the consitutionalality of the Ninth Schedule itself was being ruled on. The Nine judge bench of the court has reserved judgment regarding the Ninth schedule. If required, smaller benches will take up the individual instances and measure it against the basic structure premise. That would be the time for these superstar lawyers to make the case for unmonitored quotas. If you judge the weakness of a case based on the star status of its counsel, what can you make of this case ? If the Ninth Schedule is so righteous and constitutionally sound – they why does it need all the top superstar lawyers (taxpayer) money can buy to defend it ? “Munnabhai MABL” should be able to defend it riight.. ? Well, while I defend his right to represent anyone (my post on that below), I am not a fan of his tactics. Casting aspersions on the victim (as many lawyers who defend rapists do), is sad and disgusting. Anything that is going to benefit 87 % of people in a state can involve public money. There is nothing wrong about that. But the same court says that 100% of temple priest jobs have to be given based on CASTE and not on merit. Why is that temple priest job is based on caste and not merit…. I have no problem with using public money to defend government policies. I was just pointing out that you cant judge the strength of a case by the star status of the attorneys. Not true. Lets not smear the court with casteist paint.. There is a famous ruling in a case where a non-brahmin priest was appointed in a Siva temple in Ernakulam district in Kerala. I am too tired to google for it now. You can try yourself. I guess you are not too concerned with the nuances of law. The government does not have absolute control over temples via the HRCE act. Just because it has a majority in a current assembly it cannot change for example the timings, the rituals, the people performing the ritual roles, or put pictures of political leaders inside temples. The DMK government tried to impose a quota in temples, that was the problem. There is enough protection in the law for individual non-brahmin persons who want to perform priestly duties but are prevented from doing so by the upper castes. You cannot arbitrarily enforce 69% quotas in fields other than government jobs and education. Dont confuse religious issues with educational and job quotas. If you look at temples, there are already thousands of non-brahmins as priests. It is important to separate the church (temple) from state. This is the bedrock of a secular country. Imagine, if tomorrow a BJP government wanted 75% quota for Dalits in Catholic priests and bishops ? What would you say ? Out of 156 catholic bishops in India, 150 are from upper castes, even though dalits form 75% of the Indian christian community. ‘anything that benefits 87% of the people’ – 87% is a lie because creamy layer is not excluded so only they keep getting access again and again. If you get data from tamil nadu colleges (guindy college of engineering, anna university for eg) on beneficiaries of reservation and their background (parents income & profession, their school etc) this will be clear. And before we even go there, constitution and law is not based on the basis of ‘popular mandate’ or numbers – if it was, it would be okay for a majority community to do anything they wish to the rest because, hey, they are may be 60, 70%.. Anything that is going to benefit 87 % of people in a state can involve public money. If by anything you mean quotas, 87% is way off mark dude. Try 0.87%, even that is most charitable. Really…. Then why was the TamilNadu Rule making way for non-brahmins to be temple priest stayed by court. How can you justify the stay given by Supreme court against the Tamil Nadu Temple Priest Rule ON BASIS OF MERIT. Sorry, I cant really go much further with you on this topic. I suggest you google for “secular country” if you are really serious about finding answers. This topic is related to caste. Why are you involving religion into that. The Indian Express and the Hindu are the biggest promoters of caste hatred in the country today. Both are completely under the control of the casteist forces who are forever masquerading as social justice promoters. About the brahmin priest issue , most people dont have their facts straight . There is no rule to say that only brahmins can be priests . The majority of temples in tamilnadu have non brahmin priests . However , the crucial point is every temple has a right to have a priest of its traditional denominational affiliation . You cannot impose a protestant born on a catholic church or a sunni muslim on a shia mosque . Nor can you impose a shaiva brahmin priest ona vaishnava temple just because he has passed an exam . there are differences between denominational tradtions of various temples and that has to be respected . It is against the fact to say the majority fo temples in tamilnadu have non brahmin priests. If you include the village pujaries even then the brahmin priests will outnumber them. Out of 36,000 temples in Tamilnadu , nearly 20,000 village temples are dravidian , vernacular temples , where tamil is used in worship and the priests are non brahmins , OBCs , dalits , women ( in over a 1000 temples ) etc. Only about 10,000 odd temples are vedic , pan indian and follow sanskrit and brahminical rituals .